This retablo is based on a similar work by Murillo and is considered to be a prototype for the hundreds of copies that followed. However, rarely does God the Father appear in retablos as in the original. Instead God is represented as a dove. 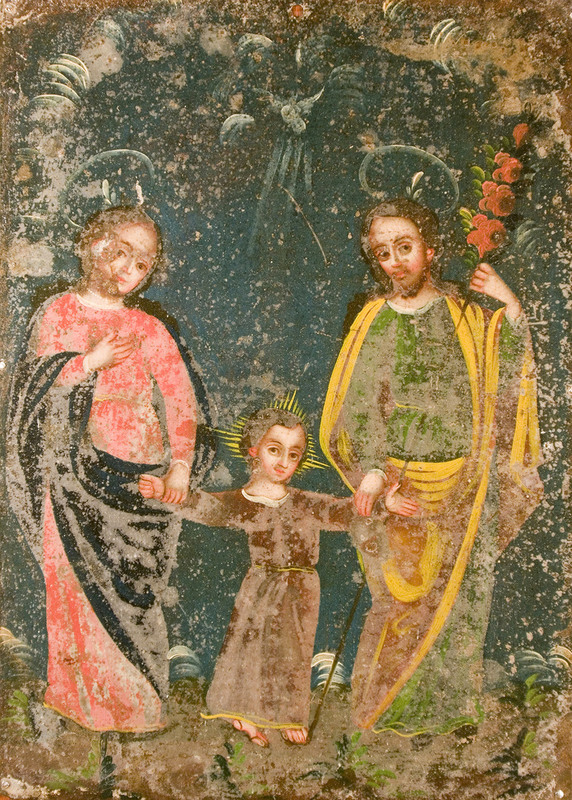 Gloria Fraser Giffords, in Mexican Folk Retablos Revised Edition wrote, “The concept of the saintly family is not based on any scriptural text, but is rather a result of Franciscan meditation inspired by the Counter-Reformation.” Most Mexicans saw The Holy Family as the perfect family and revered it as such. Christ is always shown as a young child walking between his parents, Mary and Joseph, who gaze down upon him. Mary appears in her traditional red gown with blue mantle, Christ in a shade of red and Joseph in his green gown with yellow mantle. Joseph is shown carrying his blossoming staff and directly above Christ is the symbol for God, the dove. According to Elizabeth Netto Calil Zarur and Charles Muir Lovell, Editors of Art and Faith in Mexico The Nineteenth-Century Retablo Tradition, “In New Spain (Mexico), Fray Pedro de Gante may have been the one to introduce the idea of the two trinities, the earthly (Mary, Joseph and Christ) and heavenly (The Father, Son and Holy Ghost), to the Americas.” The Spanish Jesuit Pedro Morales (1537-1614), disseminated the theme of the Holy Family during his four years of teaching theology in the Jesuit College in Puebla.